The View from Israel. : The False Images of a Young Palestinian Provocateur and Israel. The False Images of a Young Palestinian Provocateur and Israel. 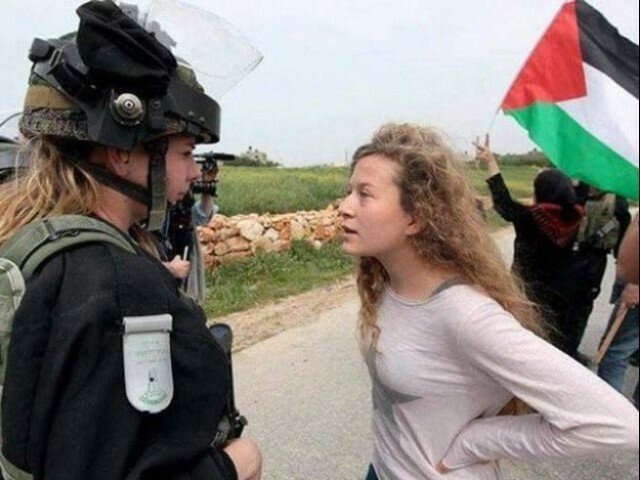 When publicity seeking 17 year old, Ahed Tamimi, the poster child of Palestinian provocation, was sentenced to jail for punching and slapping an Israeli soldier, many in the mainstream media and Hate Israel NGOs, ranted about Israeli cruelty for incarcerating a teenager. So lets look at some facts, and examine the evidence of Israeli "cruelty" in having a troublesome girl face jail time. Tamimi was imprisoned for the legitimate charges of assault, rock throwing, participating in disturbances, threats, and incitement. She's been doing it all her life, but only when videoed. She's been doing it since she was a girl. Now let's see how Tamimi "suffered" in an Israeli jail as she described her experience in her own words. "We were singing. We made group breakfasts. Every room brought their own stuff and we had breakfast outside. We also had lunch together most of the time. We also had parties. We were singing and dancing and jumping and going crazy. We did many things." Now that Tamimi has become a hero and media darling we can expect further provocations, and further jail time, from a young lady who wallows in the fame and adulation granted to her by acting out her videoed acts of assault and violence. She admits she enjoys the conditions inside an Israeli jail. ...and the Western media unquestioningly lap it up. In some rare moments of rationality it would be called child abuse, not by Israel but by the Palestinian leadership and the so-called human rights NGOs. Corbyn the Unifier. Corbyn the Peacemaker. Israel’s Nation-State Law – For Good and for All.